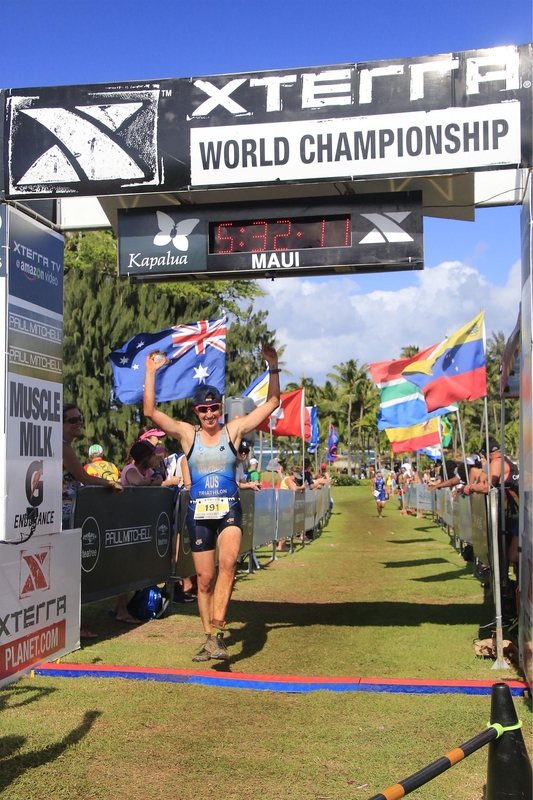 It had been a fairly good lead up to the Xterra World Champs. 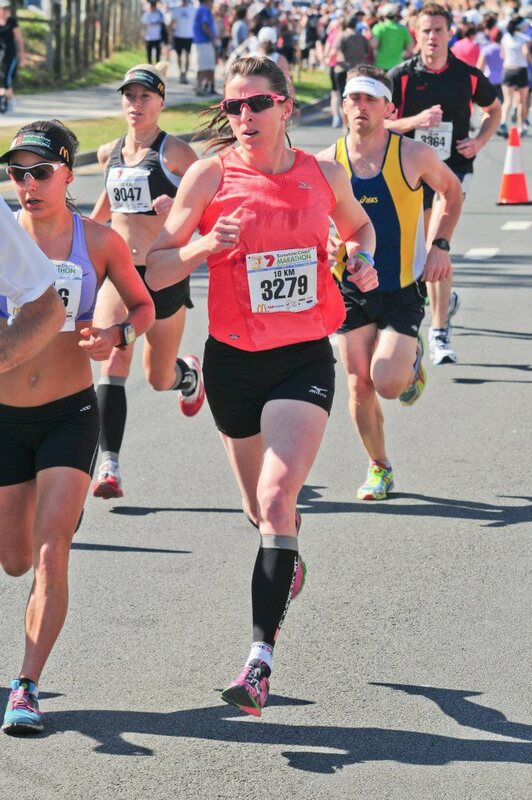 Having qualified in April, 2016 at the Australasian Champs, it was the main goal for the year. 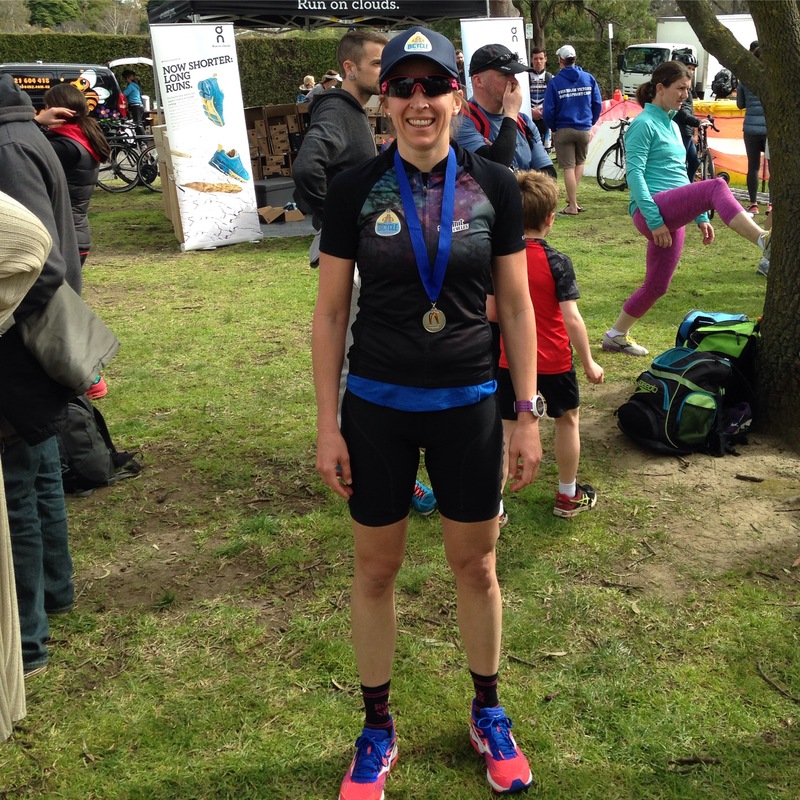 I’ve always enjoyed racing more than training and therefore worked in different events from a half marathon running race to a Cyclocross (50min circuit race), and a Duathlon to test the legs running off a bike. 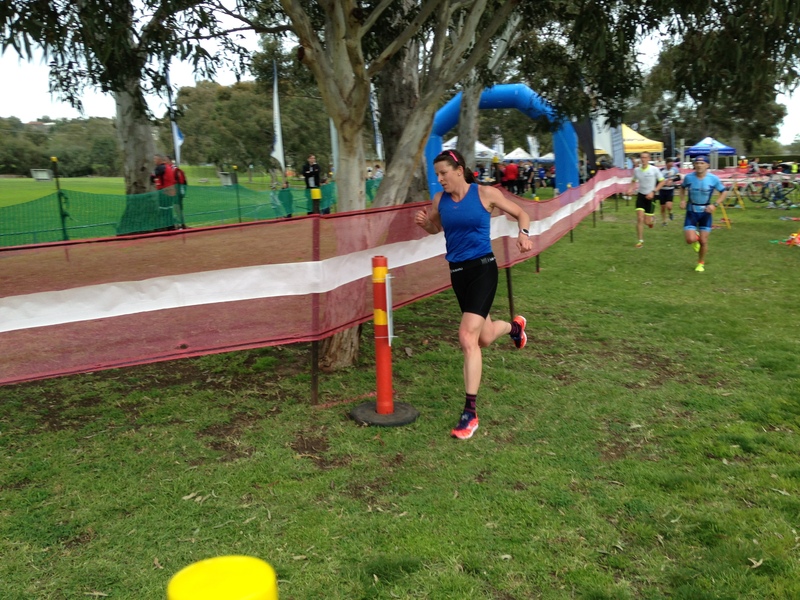 Feeling confident after a win at Duathlon, I fly over with big goals – to podium in my category. I’d seen past results and figured I could, on paper, achieve it. I finished 4th in the World in Olympic Distance Triathlon and that 10secs, did leave some unfinished business! Flying in over Maui was epic. The rugged coastline and features of the rippled mountains was breathtaking. The heat hit us like a furnace, coming from Melbourne! But one week pre in Maui, as adaptation. was also going to be key. Xterra puts on a great event. The Friday night was the Champions dinner and it honoured challenged athletes, athletes returning for their 21st race in Maui, and 2 major awards. It got you pretty pumped to be amongst it and that this was a World Championships of many nations present. My sleep pattern was a little off, with naps in the afternoon and sometimes wide awake at midnight. I’m a firm believer in the night before the night before. Usually it can be restless the night before so Friday was a good sleep. Sunday morning, RACE day. I got everything in its place on the rack, checked and rechecked, camelback, gloves, gels, shoes bike and running. The speedsuit on, goggles and cap in hand, it was down to the beach. We were greeted by pretty big shore breakers! Athletes lined up for blessings by Hawaiian elders. I prayed that the day be good to all. On the swim start, I stood on the shore line to the far right, observing a rip and avoiding the centre crush. All women started together after the men’s waves. The horn sounded, I ran in and bang, a wave hit me and I was sliding across seabed rocks. Luckily not cut up, but hard to stand on and unable to grip, if dived under. I had to swim across and then out. I lost time and I watched the orange caps through the sets of waves. I breathed, reset and went for it. Once I got into a rhythm I felt strong in the water. It was an “M” shaped swim and coming back to the beach I worked hard, knowing it was a small run around flags before hitting the 2nd half. I coasted in but couldn’t get that ride that in that seemed to be ever present when swimming out! I ran up the 150m slight incline to transition area. I had no idea what position I was in but knew I needed to get some ground. It had rained pretty hard that last few days and it was expected to be tough to ride quite a few sections of the course. When it started climbing early on, I could feel the heart rate at a red zone. I changed gears and noticed mud already building up around the rear wheel creating more resistance. I jumped off and pushing my bike I was surrounded by men from earlier waves and other women. One lucky, pre race add on, was some bolts at the front of my mountain bike shoes. A quirky Canadian, Fraser, innovated them, using a hack saw to the right length! Well they came in very handy, as other slip-slided around trying to heave their bike and self up clay inclines. No sooner would you jump on but it had clumped again, forcing you to stop and remove the mud by hand. I grabbed a stick to wipe of the tyre walls and push through the clearance front and back. This continued throughout the bike leg. I was frustrated by how much time was lost and not catching others, I was beginning to reassess what the goal was…which became JUST FINISH! I took one downhill section, that if you braked the back end would slide side ways, so I let it rip and not sure how I didn’t end up in the trees! I also ate mud pretty bad, which came up a big purple melon on my leg the next day! But I survived and managed to wear off the cable of my front derailleur and every inch of the bike was clad in mud. I also had red clay from head to toe. I laughed as I rode in just joyous to be off the bike and in one piece, of sorts. I came out for the run and it was brutal with a steep climb within the first few miles. I walked, gulped water and Gatorade. I was spent and the legs just wouldn’t go. I just calmy walked as people passed me. I knew I’d get there and at 800m I did. It was a slow jog, with a few more walks on very steep sections, then I got it. I hit the rhythm and had to capitalize. I was still a bit weary that the dehydration and energy was in low reserve and to not red line it. I was constant self talk and I often drew on that I was a runner and this is the part to bring it home. I passed quite a few, but I knew so much time was lost on the swim and bike. I still walked through each drink station ensuring I got in the fluids and part of a gel. It’s hard to digest when you’re cooked, the body wants to just lie down, not move, not eat. I enjoyed the last 2 miles of the run and tried to put on the brave face as I ran along the sand and up to the finish line. 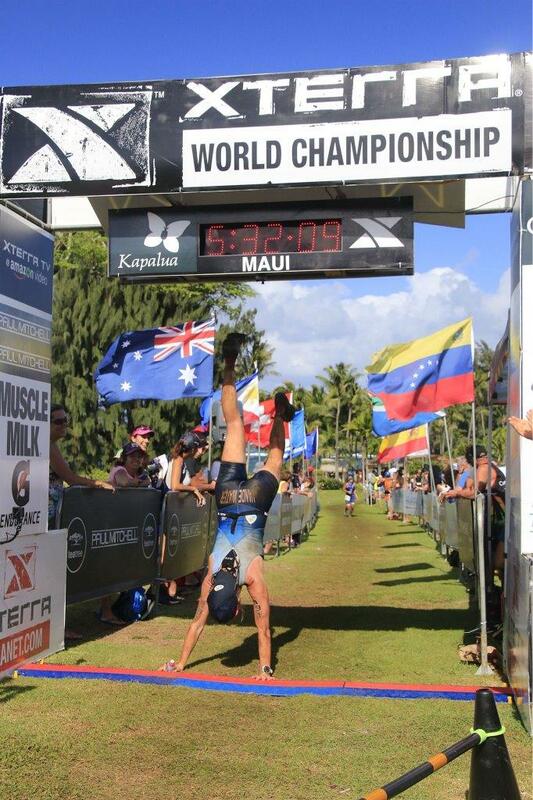 I had a feeble attempt of a hand stand and then spoke to Tommy from Xterra TV. Tom is with my first Triathlon club back at Hills and it was pretty cool to be interviewed by a fellow Aussie in another country. I met Matt and lay on the ground eating potato chips and nuts. Craving salt big time! He had hung out all day, never knowing when I might emerge form the bush! Support crew do it tough, especially when a race blows out by more than an hour! So 5hours later I had finished and as the medal had engraved, I was a survivor. Was I happy with the result? I was happy to have got to the start line, to know I did a really good preparation, with a big thanks to a program and support from Grant Giles. I was unhappy by the fact that I just couldn’t execute what I had done in training. It felt like the bike didn’t enable the chance to really attack it. Also nutrition wise, I was under done with intake, given it was so much longer out there in the heat. So in honesty 10th in my category is good, all things considering. 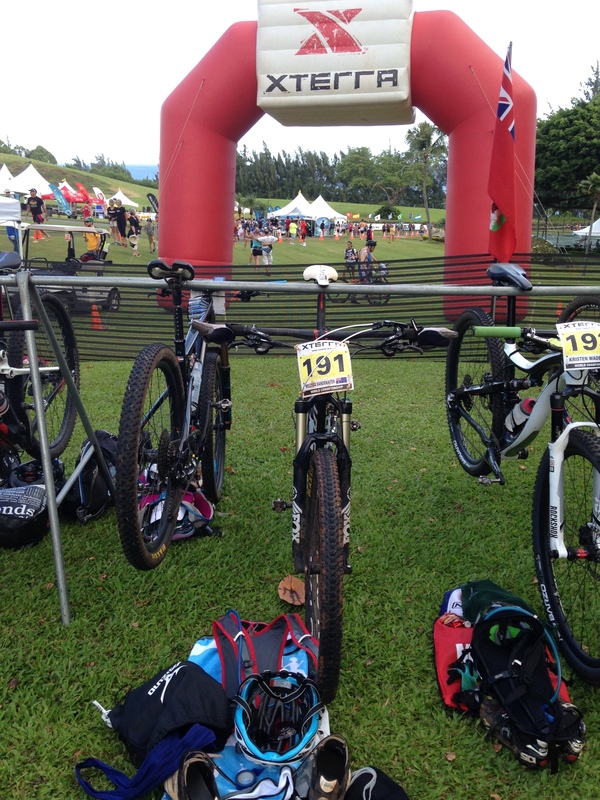 Will I race Xterra Maui again? Probably no. Like Ironman, I found it was a struggle and just finishing a race isn’t enough, not when I’ve won events and really raced them, throughout my athletic career. Personally, I get the thrill out of a tactical race, a sprint finish, going faster than I have before. So where to from here… I’ve always wanted to run a Marathon, not sure the distance suits me, given a middle distance background but it’s a bucket list thing. I’ve only ever completed one within an Ironman, after 180k bike really isn’t Marathon running! Another part of me has really enjoyed mountain biking and Australia hosts the World Champs in Cairns in 2017…..Decisions! So there is no sign of taking it easy yet… Keeping focussed and a goal is what life for me has been about and without it, there is a piece missing. Right now, it is time to chill, enjoy just riding and running for its sake and maybe even a casual swim in there too. 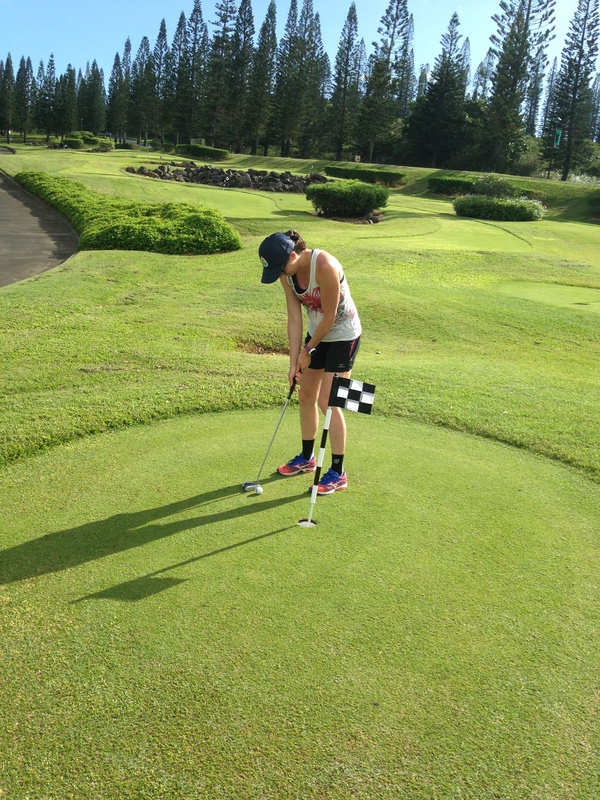 Hey, I might have to work on my Golf skills too! This athletic’s season, was a fresh return to the track after a 12 year lay off. 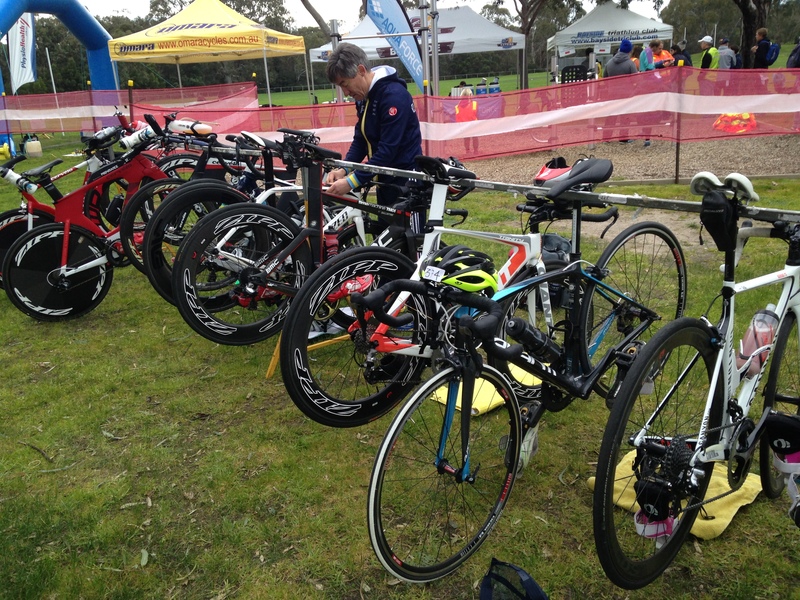 It wasn’t exactly 12 years of bugger all, but in fact a busy and fairly successful time in triathlon. I had no expectations coming back into track racing. I had been doing events in triathlon ranging from 1hr to 4hr30, so to race events less then 20mins was totally different training. Add to which, it is not what this body had adapted to, my whole physique was still carrying swimmer’s shoulders and cyclist’s quads! (proof: on Facebook, my mate wrote “Quads” underneath me running on the track, not too offended Tim!). If anything the goal in 2011/12 was to use running on the 400m track, as speed for road racing over 10km. And race I did, actually over 20 of them in one summer season! Over one week I managed to do 2 track races and 1 sprint triathlon, however the outcome the same every time: 2ND!! Maybe my success came from the pure love of running with a strong mind to win, even if the body on paper wasn’t ready to run that fast. My first race back was a 1500m, I did it in 4:33, quicker then when I was 17 and racing track only. So how did this happen? The kick starter to returning to track was my coach, Gregor. He got some speed in the old legs and importantly some strength. He works hard and expects nothing less then 100% commitment. I struggle with that, only because I love running at different places, not very structured and occasionally I jump on a moutain bike. Plus I was now juggling two jobs but lucky enough they were in running coaching and retail. 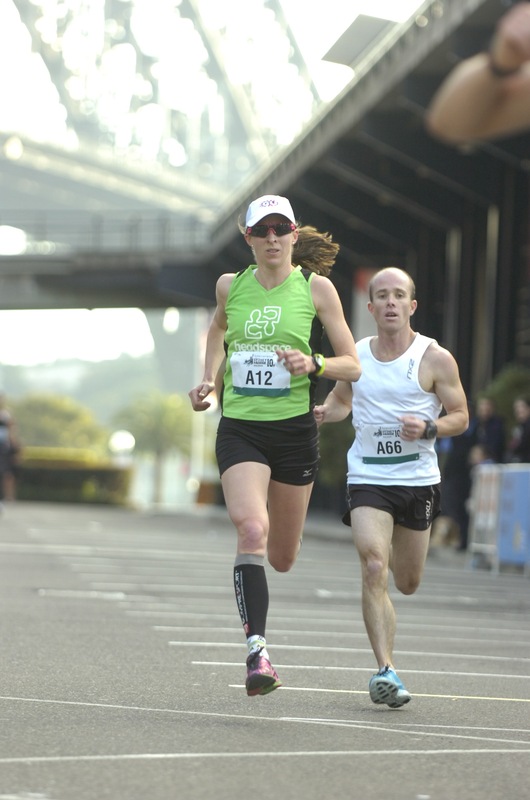 I also spent the past few years studying running, as in biomechanics, strength and coaching. It has helped “feel” my running and try to correct the weaknesses. The best teacher though is experience (of 20 years racing) and my coach! There is a certain greatness with Gregor and his squad. Himself a former elite distance runner for Poland, he had different ideas and focusses on strength and speed throughout the season. Falls Creek Camp in January definitely planted the seed to train well. I unfortunately hurt my foot jumping off crates at Christmas (yeah I should grow up!) but got in cycling, running during the 2.5 weeks. 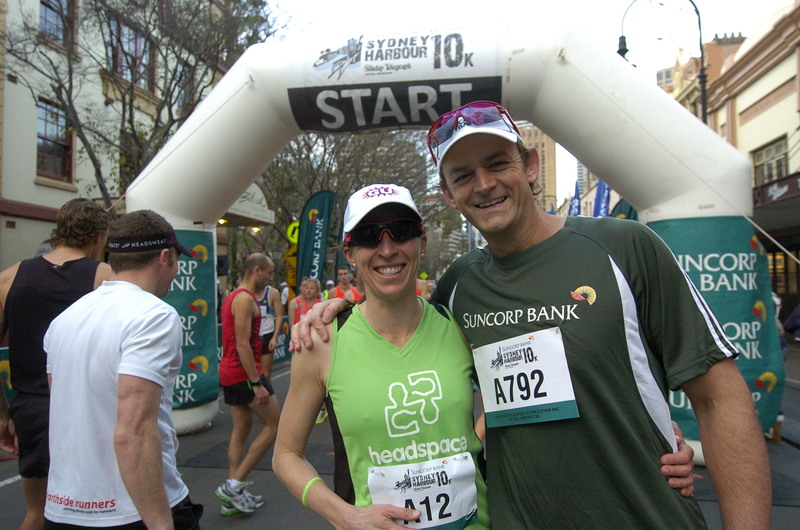 They paid off with a start in the Melbourne Track Classic/Olympic Trials were in March. 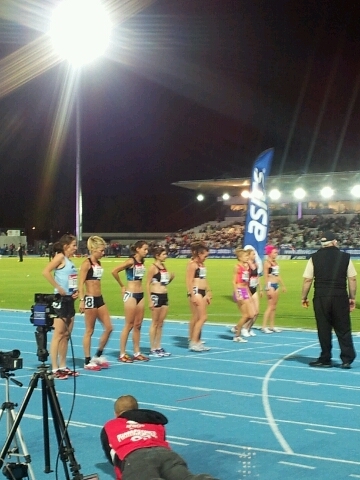 The women’s 5000m was 8:32pm (as per programme), and I was super pumped! 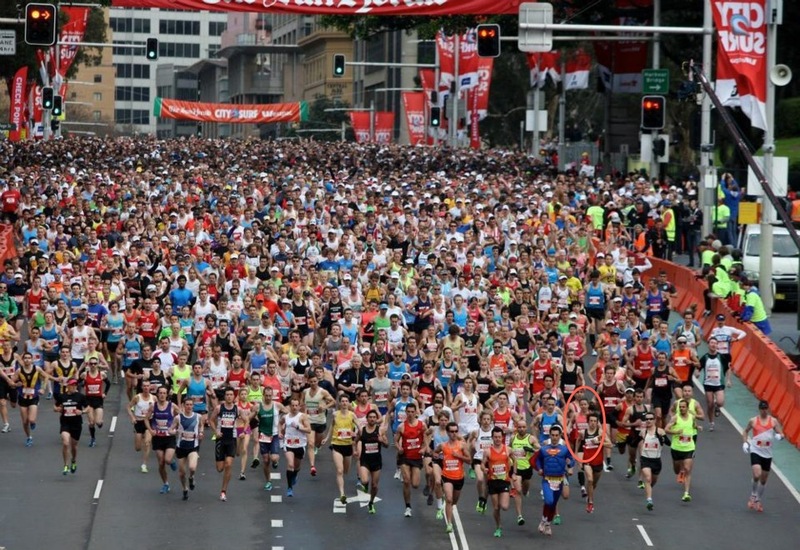 (I’m in the blue singlet, next to Georgie Clarke). Maybe it was the caffeine, or the fact that I was able to race again at a high level, an Olympic Trials. The last time was in 1999, when I was a Junior Distance Runner. 13 years later, but somewhat stronger, mind and body, I stood on the blue track soaking up the lights talking to other girls racing. My goal simply hoping to crack out a personal best (PB). I had around sub 17mins in my head, but not sure if I had the volume to back that up. The gun went and the pacer was aiming for “A” qualifier i.e. 3:05/km, very quick! I hung on for as long as possible and as a few dropped out, the field split up. 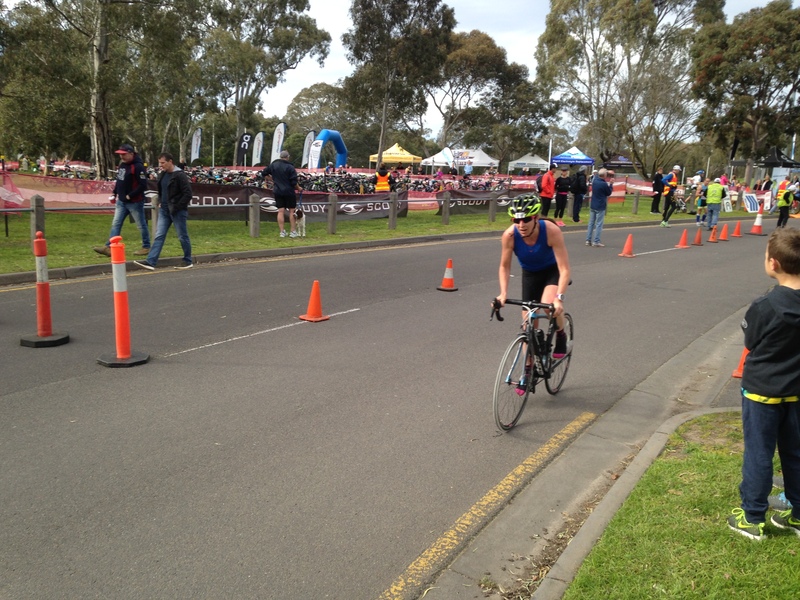 Emily Brichacek went on to win comfortably from Lara Tamsett, and I was just super stoked I didn’t get lapped! 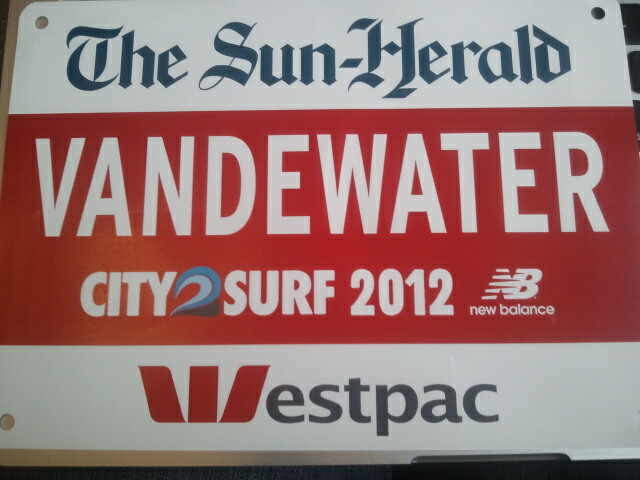 My official time 16:56.43, I’d cracked 17 and that gave me more motivation to keep training and see what comes of it. I have nothing to lose, as now I run coach for my career, so it’s all part of the apprenticeship. Come what may!